Jordan’s Furniture is a legendary Boston area retailer of furniture. They generate a carnival atmosphere in their theme-based stores. One involves a replication of Bourbon Street in New Orleans, complete with piped in Jazz. They will do anything – anything! – to get you to buy furniture. Back in March, they tantalized Red Sox fans with a unique proposition: buy furniture between March 7 and April 16, and if the Red Sox win the World Series, you get all your money back. Well, there are thousands of fans in the Boston area with two reasons to celebrate the recent success of the Sox. Eliot Tatelman, co-founder of the company with his brother Barry, will not disclose the amount of money being refunded to customers. He teases us with averages: there were about 30,000 purchases made during the promotion period. If they averaged $1,000 each, the total is somewhere around $30 million. Heck, that’s enough to pay one year of Yankee third baseman Alex Rodriguez’s salary! Tatelman, shrewd businessman that he is, has insurance to cover the losses. I would love to see that policy. I wonder how the underwriters calculated the premium. Knowing Tatelman, he chose a carrier with a New York based underwriting team, full of Yankee fans. They undoubtedly scoffed at the notion that any payouts would be needed. Tatelman probably secured very favorable terms. Oh well, it was a great marketing ploy. It’s still not clear whether the rebates will be taxable (they likely will be) or whether the entire scheme was an illegal lottery. Meanwhile, Tatelman might have to shop around a little harder if he wants to repeat the gimick next year. I suspect that the underwriters – Yankee fans or not – might not be inclined to bet against the Sox again. Oregon’s success with workers’ comp – Can you imagine a state where rates haven’t increased in nearly 20 years? No, this isn’t a dream – it’s happening in Oregon. Joe Paduda of Managed Care Matters takes a closer look and analyzes Oregon’s success in workers’ comp. Joe notes that there is no single silver bullet, but a total package that contributes to the great results: an active bipartisan stakeholder group that includes management and labor; continual monitoring of the system to measure both processes and outcomes; a structured dispute resolution process with a focus on expediting cases; state-run incentives for return to work; and remarkable employer buy-in to every facet of the program, including OSHA inspections. Go read Joe’s post, he offers more detail. South Carolina – In September, Governor Mark Sanford issued an executive order requiring the state’s Workers’ Compensation Commission to use objective standards in an effort to control benefit awards which were reported to vary “wildly” averaging 81% higher than other states. This order is receiving push back and prompted a recent clarification of the Workers Comp Order. Disaster planning – In the wake of the California fires, SHRM has issuing some excellent reports on the employer response to the disaster and how HR is coping in California. These articles make for interesting reading as case reports and they also provide valuable lessons for employers in disaster planning. Spencer Hill of Hill’s Personal Finance is this week’s host of Cavalcade of Risk. Topics run the gamut from business and insurance to gambling and health care. For those of you who are interested in investment, financial planning, and money-related matters, the regular fare on Spencer’s blog is also worth a look-see! According to NBC, the southern California fires represent the single largest movement of Americans since the civil war. Nearly one million people were evacuated, including hospitals, nursing homes, and prisons. A state of emergency was declared in 7 counties. As of this morning, 640 square miles had burned. According to preliminary estimates by the Insurance Information Institute, insured losses are expected to exceed $500 million. News reports state that overall costs are expected to be measured in billions. Historically, the most expensive California fire was the 1991 Oakland Hills fire. The media focus has been on the fire itself, the massive evacuation, and the loss of homes, but the impact of the fire on local businesses has also been enormous. In addition to property damage and temporary business interruption for many, nearly all employers will cope with an increase in post-disaster stress in their work force. Destruction of homes will cause disruption, stress, and hardship for thousands of employees. From a business perspective, the enormity of events is partially depicted by the experience of local post offices, 25 of which were closed yesterday. While mail might be delivered through rain, sleet and snow, fire posed a more formidable obstacle. USPS was unable to deliver mail to 478,000 homes and business in evacuated neighborhoods. Massive evacuations, many mandatory, shut down scores of businesses. For some employers that have roles in responding to emergencies, such as hospitals, utilities, and public safety and infrastructure concerns, the need for employees intensifies during emergencies. At the same time, employees who are asked to work longer hours are often caught between the double bind of work responsibilities and caring for family needs. Many businesses in non-essential sectors such as the technology industry simply closed in deference to their employees’ family needs and in response to official requests to keep nonessential persons off the roads. According to NPR, Qualcomm, PETCO and Jack in the Box — along with many of the region’s major employers — all pared down their staffs. Some large employers communicated with employees on their websites. NASSCO General Dynamics posted notices of shift cancellations due to air quality, the San Diego Zoo offered a page of emergency employee information, including work status and payroll notices, and SHARP Heath care noted the the rising demand for services and reminded employees of available day care services. Despite the scope of the fires, loss of life has been minimal, in no small part due to the reverse 911 emergency notification system and the efforts of heroic firefighters and rescue workers. Unsurprisingly, those battling the blaze are bearing the brunt of the injuries during the fire. CNN reports that at least 70 people have been injured, including 34 firefighters. The Scripps hospital website says that their hospitals and urgent-care facilities have treated 166 patients with fire-related injuries or conditions, including respiratory distress, fall-related injuries, chest pain, hypertension, sinus infections, minor burns and anxiety. Scripps offers a page of respiratory health advice during wildfires. The law firm Sidley Austin has agreed to pay $27.5 million to end an age discrimination suit involving 32 former partners. All were demoted from partner to counsel status back in 1999. Most were in their 50s and 60s. The EEOC says that the former partners, having no control over this management decision, were employees. Sidley begs to differ, but has agreed to pay anyway. Sidley is humongous: with over 1,700 lawyers across the world, only a small percentage of the workforce was involved in this particular lawsuit. In the rarified world of corporate law, partners are co-equals. They are generally not considered to be employees. But ultimate decision-making at Sidley was in the hands of an unelected executive committee. That committee decided on the demotions and in doing so, created at least for a moment in time a new class of employees. Sidley’s unsuccessful defense was based upon their contention that the demotions were the result of performance. That kind of slur might work against the average working stiff, but not for high powered attorneys. Indeed, the prospect of the EEOC rummaging through performance documentation did not just freak out Sidley management; some of the impacted former partners objected as well. The settlement will result in payments ranging from $122,169 to $1.84 millon. Chump change, perhaps, in the world of corporate law. Even the smallest of these payments looks huge in the world of workers comp, where a lifetime of pain and disability often translates into a few thousand dollars. The core issue here involves management authority. The demoted Sidley partners simply lacked the key powers of partnership. They rarely met as a group (it would require a convention center) and they never had the opportunity to vote on major issues. Though powerful and autonomous in much of their work, the demoted partners were powerless when it came to determining their own status in the Firm. The issue of partner versus employee is still very ambiguous. This hefty settlement has undoubtedly sent hundreds of law firms across the country scurrying to review their governing procedures. There is one thing they will not lack as they parse out the rights and responsibilities of partnership: access to counsel. Hispanic workers suffer fatalities and serious injuries at significantly higher rates than other workers and this is due in large part to language barriers. Previously, we’ve discussed the importance of keeping the multicultural workforce safe by ensuring that your safety programs address language barriers. We’ve also discussed how qualified interpreters can save lives. When providing safety training for Spanish speakers, the most obvious challenge that employers face is the language barrier. However, translation is the easy part. Bridging the cultural barrier – addressing what Spanish speakers actually believe about safety in this country – is much more difficult. And, because these workers will rarely voice their misconceptions, they are rarely addressed. The result is that employers and workers compensation providers can often go to a great deal of trouble to provide quality safety training in Spanish, only to have their workers go back to the job site and do exactly what they had been doing previously. This can be a source of great frustration, not to mention loss. The reason for it is that many Spanish speakers enter a training session holding very firm beliefs that are contrary to what they are about to be taught. Rather than instructing people who are simply uninformed on the subject, trainers have to “convert” people who believe very staunchly that they are much more valuable as workers or employees when they do not comply with federal regulations. More Physician Assistants prefer working in specialty fields over the primary care setting. I don’t think you can state the problem any better than the original court, which described the Operating Agreement as “a brilliantly drafted contract creating the constraints of an employment relationship with [the drivers] in the guise of an independent contractor model.” FedEx “not only has the right to control, but has close to absolute actual control over [the drivers] based upon interpretation and obfuscation.” The ruling goes on to site FedEx’s control over every “exquisite detail” of the drivers’ performance, including the color of their socks [no white] and the style of their hair [no pony tails]. No doubt at all about the color of the feathers: “The essence of the trial court’s statement of decision is that if it looks like a duck, walks like a duck, swims like a duck, and quacks like a duck, it is a duck.” These drivers (and thousands of others across the country) are employees. The appeals court did reject some of the prior award. Here’s one item that may break the hearts of our colleagues at the bar: Estrada’s motion asked for $619,691 in costs and $6,789,325 for his attorneys’ fees, a total of $7,409,016 — plus a 2.0 multiplier as compensation for delay and contingency, a total of $14,818,032. The appeals court found this excessive and asked the lower court to revisit the issue of fees. 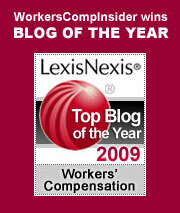 The court addresses the issue of workers comp only marginally. The drivers were required to purchase “work accident” insurance. They sought reimbursement for this expense, which the appeals court granted. However, the court did not address the issue of retroactive workers comp coverage for all FedEx drivers. Given that these “independent contractors” are actually employees, and regardless of this accident insurance (which is unlikely to be as generous as workers comp), what is the status of all the drivers injured during the course and scope of their FedEx employment? Among the many retroactive liabilities looming for FedEx as they lose appeals at different levels of the judicial system, this may be one of the biggest. As the (politically incorrect) saying goes, “it ain’t over ’til the fat lady sings.” FedEx surely has the deep pockets needed to continue their doomed appeals. But I do think I see a fat duck, waddling to the front of the stage, about to break into song. Posted in Business, State News | Comments Off on FedEx: California Quacking? Popcorn lung – We’ve previously taken OSHA to task for being slow off the mark in protecting workers who are at risk for severe respiratory illnesses related to exposure to microwave popcorn butter flavorings containing diacetyl. Now, while the agency continues to “seek evidence”, legislators have passed a diacetyl bill requiring the agency to issue an interim final standard to minimize worker exposure to diacetyl in popcorn and flavor manufacturing plants. In response, OSHA has scheduled public hearings and issued a Safety and Health Information Bulletin on Respiratory Disease Among Employees in Microwave Popcorn Processing Plants and Hazard Communication Guidance for diacetyl. But OSHA is still balking at issuing an emergency standard for diacetyl, falling back on its preferred voluntary compliance philosophy. US health insurers will start to provide coverage for medical tourism in 2008. Mini-med plans and small employers -not big health plans and blue chip companies– will lead the way. State governments will begin to embrace medical tourism by 2010. Opposition to medical tourism by US physicians will be relatively modest. Medical tourism won’t have a major, direct impact on US health care costs, but the secondary impact will be substantial. 40 years and counting – Congratulations to the folks at Business Insurance on their 40 Year Anniversary. We’ve long thought that the publication has some of the best reporters and editors in the industry – kudos to all. They’ve put together some interesting restropsective features from their 40-year history, some available online to nonsubscribers: 40 Years of Business Insurance. Debunking viral health care spam – Joe Paduda of Managed Care Matters does a great job debunking a viral e-mail from an anonymous concerned Canadian warning the U.S. about universal health care coverage. Moral of the story: never believe unsolicited emails and know your source. McCain on Health care – Bob Laszewski of Health Care Policy and Marketplace Review offers an analysis of Senator John McCain’s Health Care Reform Plan. This follows last week’s analysis of the Clinton health care plan. Immigration crackdown effects on the slaughterhouse – Thanks to Workplace Prof Blog for pointing us to a New York Times article we’d missed on how the immigration crackdown is affecting the work force in the slaughterhouse industry. Work in meat-packing industries is right up there in terms of grueling and dangerous jobs, and many plants are finding it difficult to replace undocumented workers who were displaced during recent immigrant raids. Foot power – Ergonomics in the News discusses a foot mouse / slipper mouse as an alternative when repetitive strain injuries preclude the use of a traditional mouse. Back in February of 2005 we blogged the case of Margaret Morse, a member of the Legion of Mary, a volunteer group affiliated with Christ King church in Wisconsin. In the course of delivering a statue of the Virgin Mary to a parishioner, she ran a red light and crashed into a vehicle driven by Hjalmar Heikkinen, an 82 year old barber. Heikkinen was paralyzed. A jury awarded him $17 million – and tapped the liability policy of the church to pay it. The case reached the Wisconsin Supreme Court, where a split ruling (3 to 3) sustained the original award. There apparently was language in the church’s insurance policy that included coverage for volunteers. While the Legion of Mary operated with considerable independence from the church itself, it was founded in 1968 with the support of a parish priest. It’s not far fetched to say that the specific action involved here – delivery of the statue – was related to the core function of the church. But then, any act of kindness might fall under that very wide umbrella! – If they’re going to drive at any time, check the driving records. If the record is spotty or poor, do not allow them to drive while carrying out volunteer duties. – Require a resume. It’s important to know who they are and where they come from. – Train, orient, supervise and document. The services might be free, but proper management requires the commitment of adequate resources. – If they are not working out, terminate the relationship. As in regular hiring, it’s important to take action before serious problems emerge. It’s not at all clear that any actions would have insulated the church from this unexpected liability. The court’s ruling has stretched the definition of volunteer and liability to the limits. Nonetheless, when it comes to volunteers in general, it is indeed time to look the gift horse in the mouth. The notion that services do not “cost” anything is attractive, especially in the non-profit world. But in a culture that puts a price on everything, everything has a cost. The cost of volunteers lies in the essential screening, training and supervision. Anything less opens the door to very big liabilities indeed.